Gloucester Catholic grad Greg Burke was among the latest round of roster cuts on Saturday. 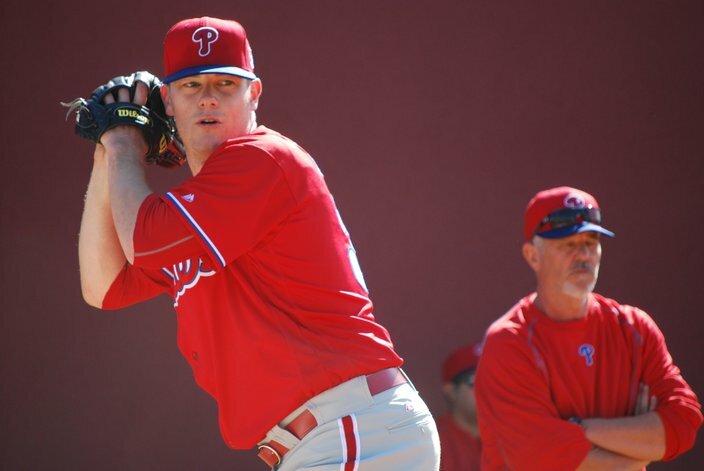 CLEARWATER, Fla. – The Phillies are expecting a grand total of 65 players in camp when full-squad workouts begin in earnest this week. More than half of those players (37) are pitchers. To accommodate everyone, there will almost certainly be ‘B’ games this spring – extra exhibition games usually held in the morning, prior to the Grapefruit League games scheduled – and obviously there will be many players making the walk down to the minor league fields, to get their work, in during the next six weeks. With each round of cuts, the number will grow smaller until the Phillies break camp and then open the regular season six weeks from Monday in Cincinnati. In the time between now and then, those 37 pitchers will shrink to 12 or 13. Andrew Bailey and Greg Burke – just like the 35 others – are hoping to be among those dozen or so pitchers. The extra incentive for them is making the Phillies major league roster would mean pitching in actual home games at Citizens Bank Park. Both grew up in the shadows of the Walt Whitman Bridge in South Jersey, Bailey in Haddon Heights and Burke in Marlton. Realistically, both Burke and Bailey would like to pitch regularly in the big leagues, period, in 2016. While the players that garner the most regular attention in the game are those that have linear progressions from the minors to the majors, rising to stardom quickly and remaining there for years, there are many, many more players who either experience struggles or have to overcome injuries that make sticking around a never-ending chore. But perhaps chore isn’t the best word choice. Bailey, 31, went undrafted out of high school and went to Wagner College, a small liberal arts school in Staten Island, where he blossomed as a hard-throwing righthander. The Oakland Athletics selected him in the sixth round of the 2006 draft and he was a reigning American League Rookie of the Year and two-time All-Star closer just four years later. He also has a World Series ring (with Boston in 2013, a year after replacing Jonathan Papelbon as the Red Sox closer). Andrew Bailey was the 2009 American League Rookie of the Year and saved 75 games in his first three seasons with the A’s. But Bailey went 782 days between major league appearances before pitching to four batters on Sept. 2, 2015 at Fenway Park as a member of the New York Yankees. A pesky thumb injury (April 2012) and shoulder surgery (July 2013) put him on the sidelines for most of the last two seasons. 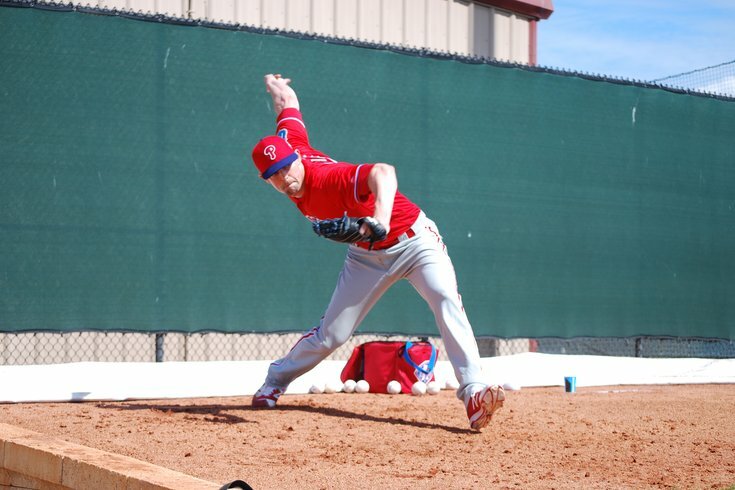 Bailey is hoping to shoo those butterflies away for good again in 2016 and instead replace it with the high-octane adrenaline of the ninth inning. He is one of a half dozen candidates in camp competing for the wide-open closer’s job. David Hernandez (two years removed from Tommy John surgery) may have an edge given his $3.9 million guaranteed contract, while Bailey and others are on minor league deals as non-roster invitees, but the Paul VI and Wagner product has the most career saves among the contenders, with 89 in six big league seasons. Burke, 33, last had a taste of the major leagues in 2013 with the New York Mets. Unlike Bailey, he was drafted out of high school (in the 42nd round of the 2000 draft by the Mets) but decided instead to take his scholarship at Duke University. Burke said he struggled in college and that it wasn’t until the final month at Duke when he saw an uptick in velocity that gave him hope he could continue playing. So he went to an open tryout with the now-defunct, independent league Atlantic City Surf, won a job, and eventually signed as an amateur free agent with the Padres. Burke pitched in the Padres’ pen in 2009 (with current camp mates Edward Mujica and Ernesto Frieri), but was up and down between the major and minor leagues in 2010-12 and suffered a hip injury (that eventually required surgery) in 2013 and 2014. Burke has pitched twice in the big leagues – in ’09 with the Padres and in ’13 with the Mets. The difference? He became a submarine pitcher (throwing sidearm, low enough that you wonder if his knuckles might tickle the mound dirt) after going through spring training in 2012 with Baltimore. He worked with pitching coach Rick Peterson at it and saw that he was able to maintain his velocity. Now that his hip is healthy, Burke is ready to show he can get big league hitters out – manager Pete Mackanin watched the righthander pitch to hitters in a live batting practice session on Sunday. With spring games still a week away, it’s not the time to predict an Opening Day roster and far too early to peg a couple of non-roster righthanders as favorites to land spots in the bullpen. But it’s fun for a couple of pitchers who remember watching the ’93 Phillies as kids to think about pitching in front of family and friends (who have had to buy A’s and Mets jerseys in recent years) this summer.